IT’S OCTOBER: DON’T LET CAR SEAT SAFETY SCARE YOU! EDUCATE YOURSELF! This month, MMLV had the opportunity to host Child Passenger Safety Technician (aka Certified Car Seat Tech), Abbie Bruno Patterson. Because we felt the information presented at the meeting was so helpful, and because many of our members were unable to attend, we thought we’d compile some of the wonderful information for you to access right here on our website. Please note that this information is not complete. It is merely a recap, and the best place to further your education on car seat safety is through Abbie herself, her website: Super Car Seat Geek <https://supercarseatgeek.wordpress.com/> , her Facebook page, www.Facebook.com/SuperCarSeatGeek , or talking with any other CPST. 1.) Harness Placement: For rear facing, the harness should be at or below the child’s shoulders. For forward facing, the harness should be at or above the child’s shoulders. 2.) Loose Installation: To check for a tight installation, grab the car seat at the belt path you are using and move it from left to right and back to front. The seat should move less than 1” in any direction at the belt path. 3.) Chest Clip: The chest clip should be positioned at…you guessed it! Across the child’s chest and be in line with his/her armpits. 4.) 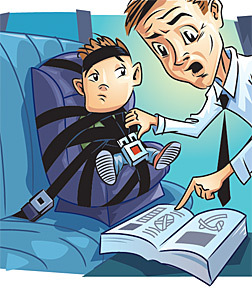 Harness Straps: Aside from placement, also check to be sure harness straps are secure against your child. Do the “pinch test”: Simply pinch the harness at the child’s shoulder above the chest clip, after removing all of the slack from the harness. If your fingers slide and you can’t pinch any slack, you’re good to go. Also note that slack can “hide”, so as you are tightening the harness, pull up on the harness, above the buckle to remove any hidden slack by the child’s hips or lower body. 5.) Seatbelt Placement: For booster seat use and seat belt only use, be the sure seat belt is centered on child’s shoulder and rests snugly across their lap, touching their upper thighs, NOT the belly. In the event of a crash, the seat belt will continue to tighten until it hits bone which is why a seat belt across the belly can be so dangerous and why it’s so important for children to remain in boosters until the belt fits them correctly. Remember that seat belts are designed to fit adults, not children. Most kids will need a booster until they’re 10-12 years of age. -PA State Law (and NJ!) requires that children be rear facing until age 2. HOWEVER! It is advised that children be rear facing until they max out the height or weight limit of their car seat (ideally staying rear facing until around age 3-4) because their skeletons are immature and they are more prone to serious head, neck and spinal injuries. Rear facing for as long as possible mitigates these risks. -PA State Law requires that children be in a booster until age 8. HOWEVER! It is advised that children be in a booster until they are at least 4’9” and until they pass the 5-Step Test for correct seat belt fit. -There is no state law however, it is advised that children remain in the back seat until at least age 13. This is due largely to skeletal development and is not necessarily a weight/height thing. -Tethers on a forward facing car seats are very important! They reduce forward head movement in a crash by approximately 6-8” which greatly reduces the risk for injury. -Thick or fluffy winter coats and jackets are NOT recommended for use in the car! They can increase the risk for injury or could even cause ejection. -After any crash, a car seat or booster should almost always be replaced (check your child safety seat’s manual). Check with your insurance agency, but some may cover the cost of a new seat. -As many as 80% of children are in the WRONG seat! -In lieu of coats and jackets, The Cozy Woggle and Car Seat Poncho are great products that keep your little one warm without jeopardizing the safe and proper use of his/her car seat. There is SOOOOOO much more to safe and proper car seat use and installation. Be sure to check out Abbie’s Facebook page, Super Car Seat Geek, read your manuals carefully, and educate yourself in order to secure your precious little cargo 🙂 From our families to yours, drive safely!